Spacesuits lay idle until a leak in Parmitano’s suit, pictured left, can be found and resolved (Credits: NASA). NASA seems to be making progress in narrowing down potential sources of the leak that foreshortened a July 16th spacewalk when it filled ESA astronaut Luca Parmitano’s helmet with water. So far the results have been negative ones, ruling out numerous causes. The primary remaining suspects, according to a NASA Spaceflight report, are the sublimator, gas trap, I-134 filter, check valve, and water separator, all located in the Portable Life Support Unit. With the problem narrowed to a short-list of suspects, NASA has been able to perform some more focused assessments of potential repair operations that the ISS crew can complete in orbit to get the suit back up and running. Although there is an array of spare suit parts aboard the station, some of the potential culprits may require special tools to repair. In an unusual last minute move, the AP is reporting that NASA is scrambling to put a specialized tool kit onboard the Progress M-20M before its July 27 launch from Baikonour. The kit could be particularly needed for repairs to the check valve. Until the cause of the leak, which covered Parmitano’s ears, eyes, and nose with 1-1.5 liters of water, is discovered, all NASA spacesuits aboard ISS are offline, barring an emergency situation. The activities scheduled to be completed during the July 16 EVA are not considered to be urgent and will be delayed until the suit is repaired or the problem isolated. If the crew cannot resolve the situation on orbit, NASA will likely arrange for the leaky suit to be sent planet-side aboard an end-of-year SpaceX Dragon cargo vessel. NASA Spaceflight reports after completion of the scheduled EVA tasks, the US does not have another planned EVA until 2015. There are several upcoming Russian EVAs in preparation for installation of a new module later this year. The upcoming launch of Progress M-20M will be the first to take place from Baikonour Cosmodrome since a Proton-M rocket crashed into the landing site shortly after its July 1 liftoff. Although officials originally thought they might need to close the entire site for cleanup for two months due to environmental contamination from the 600 tons of toxic fuel, subsequent analysis seemed to indicate much lower pollution levels than anticipated. All non-Proton launches are being kept to their original schedules. 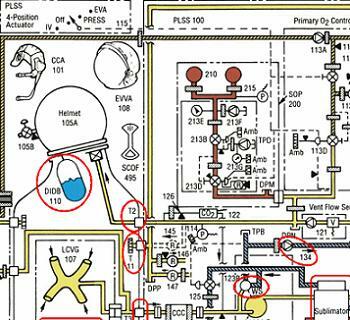 The circled areas on this NASA EMU spacesuit diagram show components investigated for leaking. Many of these, such as the Disposable in Suit Drink Bag (DIDB), have been ruled out (Credits: NASA Spaceflight/L2).